The mills used to manufacture pharmaceuticals are becoming increasingly diverse: New requirements are demanding optimised processes and innovative approaches. But the sums all have to add up in the end despite all the technical possibilities. So, when it comes to grinding new products, the path is often laid out. It frequently involves performing grinding tests on an existing device, evaluating the results, and adjusting the mill to the product properties. What results does this path lead to in practice? What obstacles have to be expected? And how can they be overcome? Evaluations have been performed right down to the smallest detail in Frewitt’s grinding tests laboratory for more than a decade. It has been even longer since tests were carried out on the different mills. The sheer volume of product properties needing examined is enormous. And an outstanding level of expertise is required too. So, does that mean that testing will be dispensed with in future? No. Quite the contrary, in fact, as nowadays, products demand more of the devices, are in some cases even more sensitive, and therefore have to be treated more gently than before. It is no longer enough to know that a product is hard, fibrous, soft, sticky or sensitive to temperatures. There are products with properties that change when a temperature of 40 °C is exceeded during the grinding process. These products may even become ineffective if they are unintentionally heated up, as is the case with enzymes, for example. Due to these findings, Frewitt nowadays assumes that the suitable mill type can only be effectively determined following a series of tests, particularly when dealing with delicate products. While there are different ways to achieve the same goal, not all mills will produce the same result. Because neither Frewitt nor its customer knew beforehand which mill would be best-suited for the product tests, there was only one course of action: perform tests on different mills. The customer, which operates in the pharmaceutical industry, was already familiar from previous applications with a competitor’s conical sieve mill, which had been used to grind the new product but failed to produce the desired result. Because the customer wanted to compare like with like, they decided to perform a series of tests on Frewitt’s conical sieve mill, the Coniwitt. Due to the required throughput, it was agreed that the product would be ground on the Coniwitt-150, a mill with a conical sieve insert which, depending on the product properties, achieves a throughput of 500 to 1,500 kg/h and grain sizes of up to 150 µm. From earlier test series involving products with similar properties, the testers at Frewitt surmised that the limit would be reached with the Coniwitt’s capacity. In line with the saying “Better safe than sorry”, the product was also to be tested on the Oscillowitt-3, a sieve mill which alternates between rotating and oscillating and has a low circumferential speed which is suitable for gently grinding temperature-sensitive products. 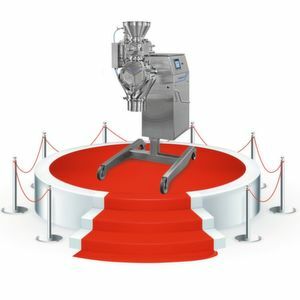 The team was also keen to bring the Hammerwitt, a hammer mill with a large milling force, on board, because it is extremely well-suited to milling free-flowing and hard products. Laboratory test brings light into the darkness, at an ambient temperature of 22 °C and 58 % humidity, the free-flowing and hard product was tested on the Coniwitt-150, Oscillowitt-3 and Hammerwitt-3 mills, and the results were evaluated on a Mastersizer 3000.